AER is now celebrating itï¿½s 15th anniversary with a 10% off all retail customers including shipping and handling. for the dealers 10% off not including shipping. the AER oil cooling system continues to enjoy excellent testimonials as well as great reviews in national magazines. 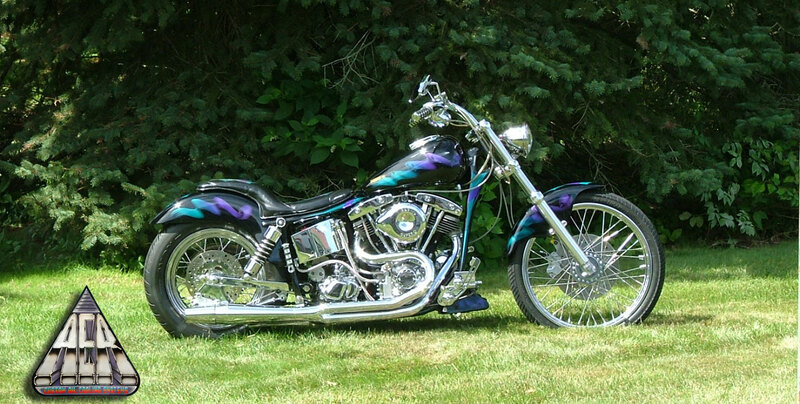 This past 15 years, tony reise, founder and owner of aer, has won various shows with his 50 caliber shovel head. 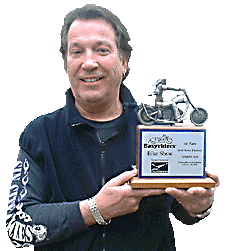 the 2000 Easyriders show in Philly was Tony’s biggest win. Taking first place in the street custom class (judged) competion. and, of course, Tony’s bike sports the sleek looking aer oil cooling system. Does not serve any functional purpose. 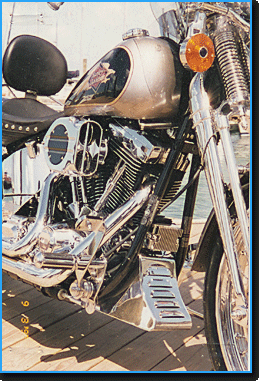 mig welded on the outside only – greater possibility of stress cracks to housing and chroming is not recommended for this reason. bracket system design and materials lack long term roadworthiness capabilities. not louvered on the front and bottom sides. has independent road testing been done to indicate roadworthiness & anticipated product life? 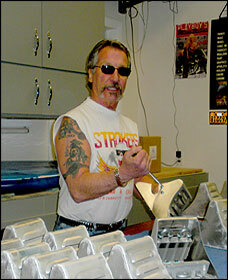 Leading oil cooler – average retail cost $159.00 each plus cost of brackets, $40.00 thermostat = total $199.00. As you may already know, increasing oil capacity will benefit your engine in cooling and longer life! in order to equal aer’s surface area you would have to purchase two (2) coolers @ $159.00 – $318.00. so in the long run, don’t you think that purchasing a product to promote longer engine life, looks great, is proven to be no.1 in oil cooling, road worthiness and design is worth $55.95 more? If you have any questions regarding our product or service, you can contact us by phone or by filling out our Contact Form and we'll get back to you as soon as possible. Hope to hear from you soon.